Please download a full version of our e-Brochure in Adobe Acrobat PDF format. The freely available PDF viewer is required and can be downloaded here! Businesses Getting Results™ (BGR for short) is a membership program for selected clients and business people who want to improve a wide range of aspects of their business in an easy, manageable way. BGR™ is a new kind of program where members meet once every 4 to 6 weeks for just 2 hours to work on a different issue or strategy. We review and discuss specific topics and look at how to implement the strategies within your business. The number of participants in the BGR™ sessions will be limited to just eight, allowing for the highest level of personal attention and support. At each meeting you will have the opportunity to network and build stronger relationships with like-minded business people, increase referrals to your business as well as sales. Solve business-building issues in an easy and useful way. Benefit from the collective experience of your peers and your team here. Network with other business owners and executives like yourself. 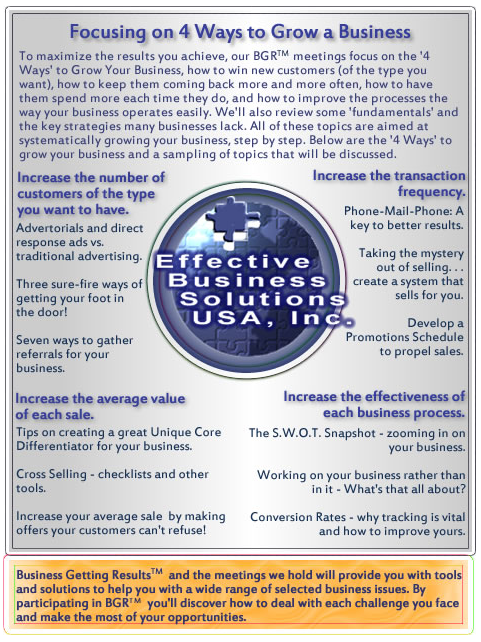 Solve a different issue in your business every month. Each month we select a different topic. One month it may be "How to keep customers coming back" and another might be "Getting a handle on your cash flow." The topics are varied to cover a myriad of areas. The meetings are designed to give you some specific action steps, and the information you need, to take those steps and actually begin to implement new strategies and solutions into your business. That way, you begin to see some real changes and increases in profit as well. Access to privileged information and ongoing support. In addition to the monthly meeting, you receive selected articles and research studies. These include "how-to´s" on specific topics to take care of your more individual needs. "By taking part in the BGR™ program I learned how to compete on issues other than price, even when price appears so important." "The BGR™ program showed me how to substantially bring up my bottom line and at the same time helped me to figure out how to avoid last minute cash crunches. A most worthwhile expenditure of my time and money!" "BGR™ helped me to find out what my customers really wanted to buy and showed me how to keep customers coming back over and over and not lose them to my competition." By focusing on proven business building strategies and new ideas, BGR™ helps you tackle the challenges that are holding you back AND discover the business opportunities that are right at your doorstep. All of which are designed to build an even better business for you. Your business grows, your profits improve, your life and life-style get better. With a focus on implementing ideas rather than just talking about them, BGR™ really is a very different hands- on program. For instance, at the end of each BGR™ meeting you commit to an 'Action Plan' to implement that idea just as soon as possible. This ensures you see better results and achieve more and more of your goals.